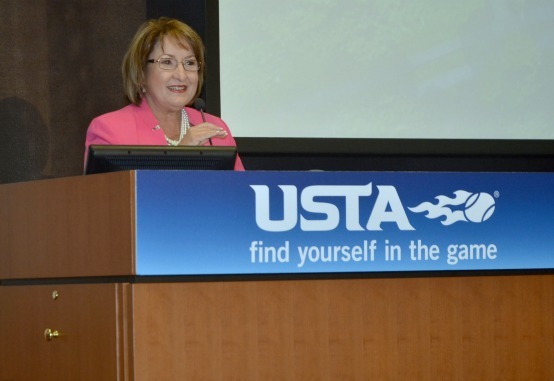 Orange County Mayor Teresa Jacobs spoke as part of the announcement ceremony for the creation of the United States Tennis Association’s (USTA) new state-of-the-art facility at Lake Nona. She was joined by Florida Governor Rick Scott and City of Orlando Mayor Buddy Dyer in welcoming the new facility that will create jobs for citizens and attract investment while enhancing both Central Florida and the sport of tennis as a whole. The planned 100-plus court, 63-acre tennis center scheduled for completion in late 2016 will house the USTA’s Community Tennis and Player Development divisions and accessible to youth and recreational players as well as collegiate and professional tour level athletes. Partnering with Lake Nona and Tavistock Group along with a consortium of regional and state partners, the USTA sees the new facility as a hotbed for tennis in the nation’s top destination city. The USTA Player Development division plans to move its national headquarters from Boca Raton to the new Orlando facility in order to provide greater opportunities for the next generation of American tennis champions. The facility will play host to tennis events ranging from 10 and under team tennis to national championships. Details of facility programming are forthcoming. Photos of the announcement are available for use by the media on Flickr.